The Answer Is Blowing In The Wind | Fulcrum ConsultingWorks Inc.
Are those breezes, or the beginning of a major storm? Great leadership can tell the difference. Can your company adapt to the ever changing business environment? 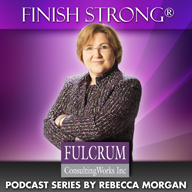 This entry was posted in Podcast Series: Finish Strong® and tagged Leadership by Becky. Bookmark the permalink.